The Ogre of Oglefort isn’t really what I expected it to be and for that I was incredibly grateful. I assumed, because I didn’t actually read the description because I love the author, that it would be the same old damsel in distress kind of story. I was surprised to find out it was the complete opposite! At first I thought the plot of the book was one that was incredibly overdone, but I was pleased that it took an entirely different turn. 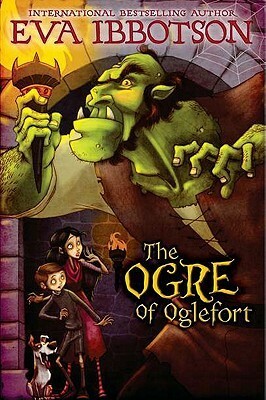 Four characters, Ulf Oakroot (troll), Dr. Brian Brainsweller (wizard), a Hag, and Ivo (orphan), are chosen to rescue a princess from a horrible ogre and bring her back to her family. When they arrive at the castle to slay the ogre they are utterly confused because nothing was as they expected. Can’t say much else without giving anything good away, but once they get to the castle the story really picks up! 🙂 The only downside of the book was events happening rather quickly. One second they would be in one place and the next somewhere else with little in between. It just moved really fast with few details. However, this is perfectly acceptable for a children’s book since children are more interested in the story and characters rather than the details. I loved all the characters but the most developed ones were Ivo and Princess Mirella. You really get to know them throughout the story and end up falling in love with them. They both have great personalities, but I think Mirella’s was even better than Ivo’s personality. She was by far my favorite character in the book and I think that has a lot to do with me liking female non-damsels in distress kind of characters. Those who are strong and stand up for what they want. The other characters were great too including the Ogre who wasn’t at all what I expected, the troll, the Hag, and the wizard, who should really choose a different profession. I enjoyed all of them. I also thought all the creatures that Ivo and Mirella run into were interesting as well. View this book on Amazon and Goodreads! Next Post My New Blog!